Rev. Gerald C. Miriani, the only child of Mario and Lena Perotta Miriani, Gerald was born March 7, 1935, and was welcomed into eternal life on August 13, 2017. He is survived by his best friend and cousin, Dee Sommer, her sister and brother, and a host of people whose lives he touched and made better. He grew up in Herrin, Il and attended Southern Illinois University before entering the seminary at the Benedictine Abbey in St. Meinrad, IN. Ordained a priest for the Diocese of Belleville on June 2, 1962, Fr. Geraldâ€™s first assignment was to St. Theresa Parish. He then moved to St. Maryâ€™s Parish in Trenton, IL, and spent five years commuting to teach religion and philosophy at Mater Dei High School in Breese, IL. 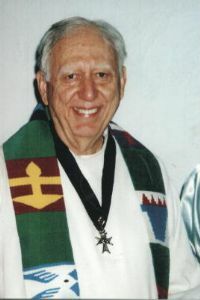 He then was made the pastor of St. Barbara Parish in Okawville, where he served for six years. Fr. Gerald next moved to Centralia, IL. Where he was the pastor at St. Maryâ€™s Parish and worked with an order of Polish nuns to operate a parochial school. His final assignment was as Pastor at Corpus Christi church in Oâ€™Fallon, Il near Shiloh, where many of his parishioners were military personnel stationed at Scott Air Force Base. After helping thousands to achieve better lives, Fr. Gerald retired from full time ministry and moved to Tucson in 1992, where for 22 years he was an associate priest at St. Pius X Parish. He continued to sat Mass until 2016 when his health substantially failed and he moved to assisted living. Fr. Gerald was a world traveler. Although often in Rome, where he once met Pope John Paul II, his favorite place to visit was the area of northern Italy, especially Lago di Garda and Vittuone, the village of his motherâ€™s birth, where his relatives welcomed him into their lives. Funeral Mass will be at St. Pius X, 1800 North Camino Pio Decimo, on Saturday August 19 at 2:00 PM. Quiet meditation begins at 12:00 noon. A reception in the parish hall will follow. Burial will be private.